Dmitry Koroteev leads Digital Petroleum Research lab. Dmitry graduated from the Lomonosov Moscow State University (MSU) with a Master’s degree in Molecular Physics in 2006 and continued his studies there as a Ph.D. student, obtaining his Ph.D. degree in Chemical Physics in 2008. In 2015 Dmitry took two continuing education units on Big Data Challenges from MIT. While still an MS student, he joined Schlumberger, where he successfully built his career from Research Associate through Research Program Manager for Digital Rock & Fluid theme to Project Manager and Acting Research Director of Production Intelligence Department over the course of nine years. His research focused on the following areas: enhanced oil recovery, 3D imaging and image processing, reservoir characterization and stimulation, fluid and rock physics, complex flow modeling, and, most recently, predictive Big Data analytics. 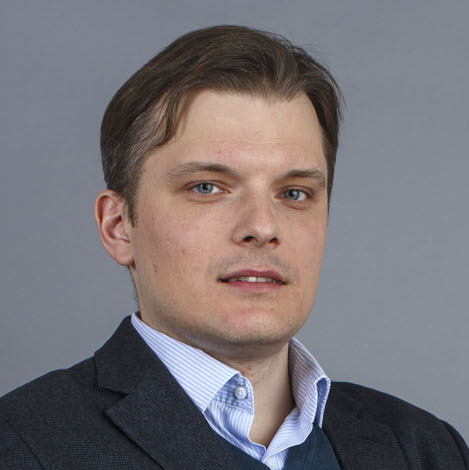 In 2014 – 2015 Dmitry worked as Head of Department of New Technologies at Gazprom Neft (before returning to Schlumberger). Here, he significantly enhanced his managerial experience, managing a portfolio of 50+ projects related to development and implementation of new technologies, as well as participating in the development of a long-term technology strategy of the corporation. Dmitry’s teaching and mentoring experience includes a lecturing on “Geostatistics and Reservoir Simulation” at Skoltech, practical course on experiments in classical mechanics for first year students of MSU, supervision of several MS students from Skoltech and MIPT, mentoring of multiple research interns at Schlumberger (MS and PhD students from MSU and MIPT). I.Doroshchenko, I.Znamenskaya, D.Koroteev, T.Kuli-zade (2017). When shock is shocked: Riemann problem dynamics at pulse ionization of a shock wave. Physics of Fluids, 29(10), 101701. A. Nadeev, D. Mikhailov, E. Chuvilin, D. Koroteev, V. Shako, Visualization of clay and frozen substances inside porous rocks using X-ray micro-computed tomography, Microscopy and Analysis, 2013, Vol. 27, No. 1. A.Mutina and D.Koroteev, Using X-Ray Microtomography for the Three Dimensional Mapping of Minerals, Microscopy and Analysis, 2012, Volume 26, Number 2. V. Bazilevskii, D. A. Koroteev, A. N. Rozhkov, and A. A. Skobeleva, Sedimentation of particles in shear flows of viscoelastic fluids, Fluid Dynamics, 2010, Volume 45, Number 4, pp. 626-637. I.A. Znamenskaya, D.A. Koroteev, and A.E. Lutsky, Experimental study of the two-dimensional problem of plane discontinuity breakdown at pulsed ionization of a flow with a shock, Doklady Physics (Proceedings of Russian Academy of Sciences), 2008, Vol. 53, No. 6, pp. 328- 331. © Pleiades Publishing, Ltd.
I.A. Znamenskaya, D.A. Koroteev, and A.E. Lutsky, Discontinuity breakdown on shock wave interaction with nanosecond discharge, Physics Of Fluids, 2008, Vol. 20, issue 5, p. 056101. D.A. Koroteev, On effect of plasma formations on shock waves (in Russian), Flight (Russian), 2008 No. 2, pp. 36-42. O.N. Zhuravlev, D.A. Koroteev and K.I. Popov, Decrease of hydrodynamic resistance at stochastic treatment of the flow (in Russian), Applied Physics (Russian), 2008 No. 2. I.A. Znamenskaya and D.A. Koroteev, Nanosecond volume gas discharge in a flow with gasdynamic discontinuities, Moscow University Physics Bulletin, 2008, Vol. 63, No. 1, pp. 80- 82. © Allerton Press, Inc., 2008. Young Professional Best Paper SPWLA/SCA. September 2013. Paper “Direct hydrodynamic simulation of multiphase flow in porous rock” was recognized as Young Professional Best Paper prsented at International Symposium of the Society of Core Analysts, Napa Valley, California, 16-19 September. The paper is authored by Koroteev, D., Dinariev, O., Evseev, N., Klemin, D., Nadeev, A., Safonov, S., Gurpinar, O., Berg, S., van Kruisdijk, C., Armstrong, T. R., Meyers, M., Hathon, L., and H. de Jong.